With only five ingredients, this creamy baked fish with a crunchy crumb topping is a breeze to make! 1. 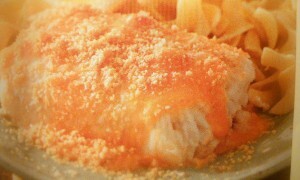 Arrange the haddock fillets in a greased 13×9-inch baking dish. In a small bowl, combine the soup, onion and Worcestershire sauce; pour over the fillets. 2. Bake at 375 degrees F. uncovered for 20 minutes. Sprinkle with the cracker crumbs and bake an additional 15 minutes or until the fish flakes easily with a fork. Makes 6 to 8 servings. * Cod fillets may be substituted for the haddock, if desired. Recipe and photo are from a Taste of Home magazine. hhhmmmm…is cream of shrimp soup good??? i don’t know , i am very particular about shrimp items….and haddock, is this white fish, like what they use for fish sticks and such?? i don’t know if i would be brave enough to try this????? ?